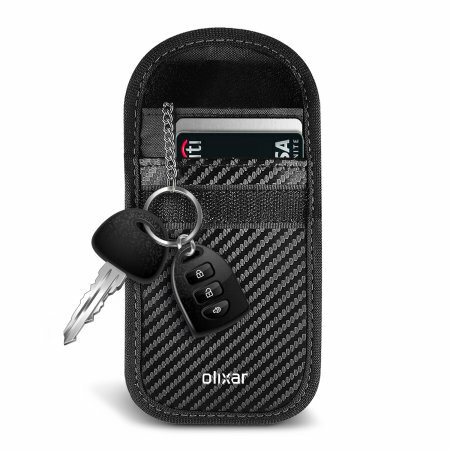 Keep your car protected with this keyless entry anti-theft pouch from Olixar. Featuring RFID blocking nano technology and a Faraday cage, this pouch decreases the chances of your vehicle being stolen. Edullinen, luotettava postipalvelu, sopii kiireettömille tilaukseille. Tämä palvelu on jäljittämätön. Lähetys toimitetaan yleensä 5-10 arkipäivän kuluessa..
Jäljitettävä postipalvelu. Lähetys toimitetaan normaalisti 3-5 arkipäivässä. Nopea, turvallinen ja luotettava palvelu. Etuna täysi jäljityspalvelu, jonka avulla voit seurata pakettisi kulkua matkan varrella. Lähetys toimitetaan yleensä 1-3 arkipäivän kuluessa. Simply does its job. Use it and your car is more secure with almost no effort. Really handy pice of kit. No need for anything more when having a stroll along the prom. Great stuff. Nothing to ask, pretty straightforward to see what it is and what it does. 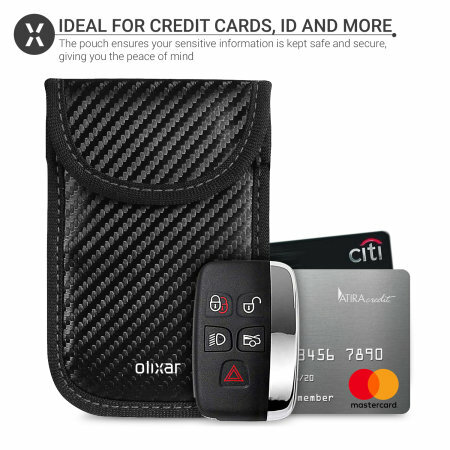 With an increase in car theft being linked to the number of cars featuring keyless entry and keyless go technology ensure your vehicle is kept protected with this signal blocking pouch from Olixar. 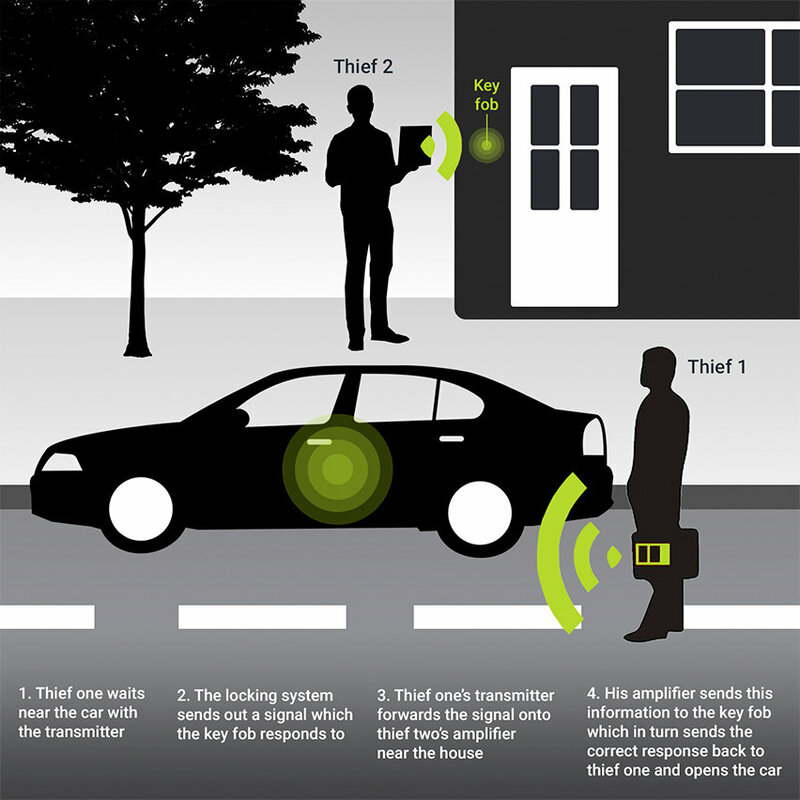 Each pouch makes use of a Farday cage and is combined with nano technology which blocks the RFID and NFC signals transmitted by your car's keyless entry fob and so prevents thieves from intercepting these signals and gaining entry into your vehicle. 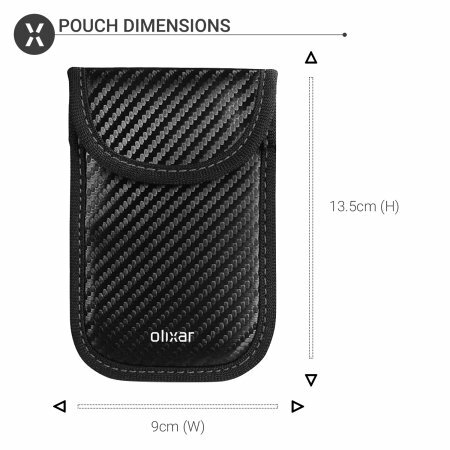 As the Olixar RFID signal blocking pouch has been designed with protection and convenience in mind, it features twin pockets meaning it can even used with your credit and debit cards. The pouch ensures your sensitive information is kept safe and secure, giving you the peace of mind that your cards are not being read remotely without your knowing. 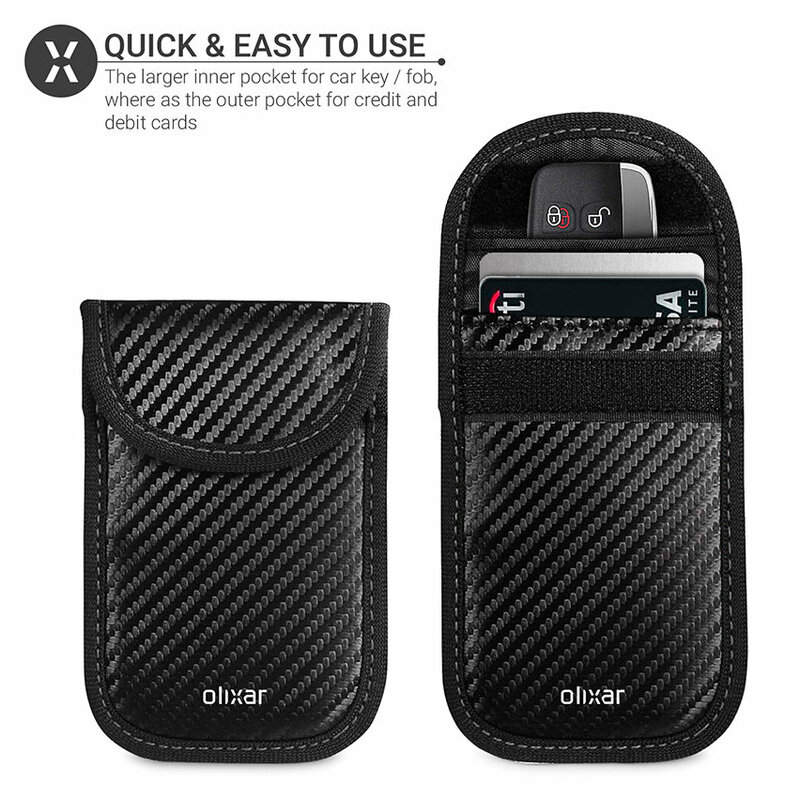 Featuring a leather style construction with a carbon fibre style finish and red stitching, the Olixar signal blocking pouch has been designed to be durable and lightweight, meaning you'll be able to take this stylish pouch where ever you go. The Olixar RFID Signal Blocking Pouch has been made extremely easy to use, however it's important that the correct pocket is used to protect your car key / fob and credit card. 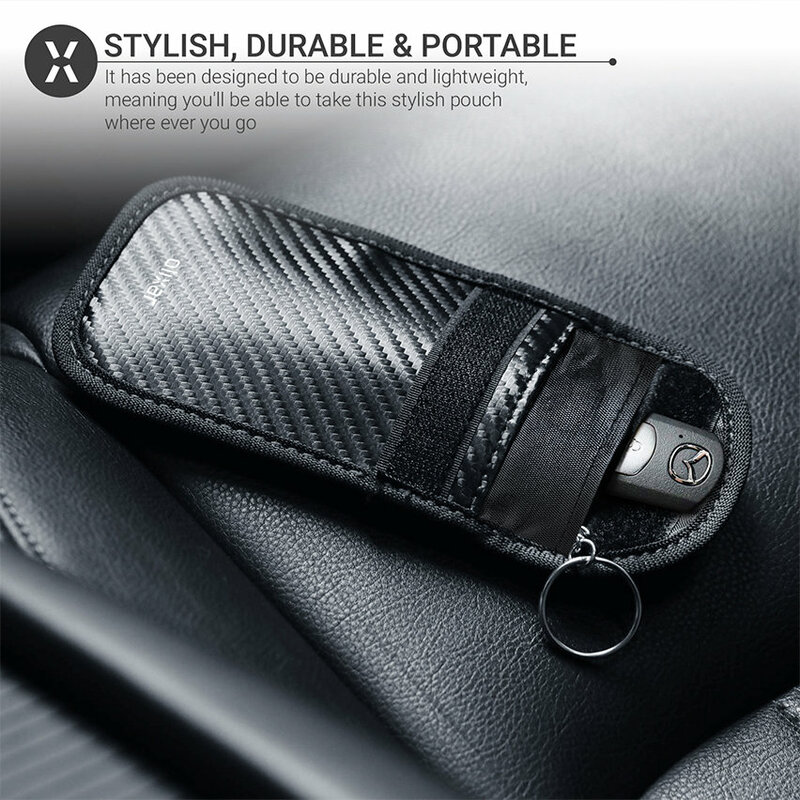 The larger inner gold pocket has been specially designed for your car key / fob, where as the outer pocket is to be used with credit and debit cards. 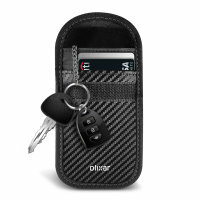 Simply place your car key / fob or credit card into the pouch, close and fully seal the velcro pouch ensuring there are no gaps. Once sealed, all signals will be blocked.